Back in '04 I remember appreciating Michael Mann’s return to crime filmmaking after the awful disaster of ‘Ali’. And now, re-watching the new Blu-Ray release, the film comes off as surprisingly dull and glorified high concept action film morphed into the Michael Mann cool styling of his other crime films. I’ve expounded on this at great length before, but Michael Mann’s switch over to high definition has not been kind to him. While filmmakers like David Fincher can retain the same look as his 35mm films and taking advantage of the freedom the digital medium allows, Mann’s newer films lose more than it gains. To start, Dion Beebe and Paul Cameron’s colour scheme is superb. The Los Angeles exteriors are lit up with an eye-pleasing hazy glow, like a permanent magic hour or a giant fluorescent lighting up everything. As a result, under the high definition format, it’s as crisp a film as Mann’s ever made. Unfortunately he also loses texture, specifically in the action scenes. Fast motion across of film has a smearing effect which our eyes are used to, under the crisp high definition image, much of the swoosh is gone resulting in what’s known as the ‘video look’. ‘Public Enemies’ and ‘Miami Vice’ suffered badly from this, mainly because well, there just more action in those films than ‘Collateral’. The technical aside, not even Michael Mann slickness could correct some staleness of the material. The script by Stuart Beattie (subsequently polished by Mann himself) had been circulating for years and had fingerprints from a number of other directors, specifically those whose names remained on as Executive Producers, Chuck Russell and Frank Darabont. Under the direction of Michael Mann, he tries to coverts it to be his own. Vincent, for example, the lead character, a steely eyed robotic terminator like hit man with his salt and pepper hair and grey jacket looks a lot like Neil Macauley from ‘Heat’. The film suffers most from the incongruence of Michael Mann’s aesthetic with the prefabricated action movie plotting. The strengths of all of Mann’s films have been his attention to realism of his characters and the environment. No matter if it’s a crackerjack thief, a beat cop, or a stone cold killer, within these genre characterizations Mann has always been able to draw his characters from the inside out. While none of us could identify with Robert De Niro as a lifer criminal or James Caan as a burgler, Mann crafted the world of the characters with such authenticity, they seemed more real than other crime films. The against-type casting of Tom Cruise actually worked for me, but his character is fumbled and unnecessarily overwritten. Cruise and Foxx have some interesting conversations along the way, but conversations which never would happen if Vincent were indeed a real hit man killer. Mann at first portrays Vincent, his unhesitating trigger finger and forthright attitude, with the ruthless workmanlike intensity he’s known for. But the Michael Mann from ‘Thief’ or ‘Heat’ or ‘The Insider’ would never have Vincent confess his childhood father-issues to Max. This scene feels slapped on, to give depth to a hit man where this kind of depth is not necessary. Jamie Foxx as Max, the cabbie, never ever feels real. From the outset he’s drawn from the outside in - a stock hero character with his personality traits stamped onto him in order to make him relatable as an everyman. The postcard on his sun visor, the pamphlet of his dream car he hopes to buy someday, his charismatic self-deprecation and his working class integrity never fit together, or least don’t seem to fit on the shoulders of Jamie Foxx the actor. Mann also fumbles on the depiction of the police. Mark Ruffalo, as a Latino cop, is underutilized and Peter Berg is completely out of place as his partner. Berg and Ruffalo shouldn’t even be occupying the same space. It feels like Mann trying to inject a cat and mouse chase between cops and criminals a la 'Heat', or ‘Manhunter’, but just not enough time or attention is given to the cops for us to feel the pressure or suspense or attachment to these characters. As such when Ruffalo is unceremoniously killed, the jarring effect Mann intends never really hits us. 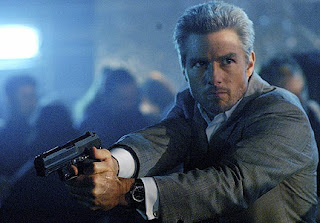 ‘Collateral’ works best in its three showcase scenes. Vincent and Max’s confrontation with the Jazz musician is marvellous bit of misdirection and Max’s confrontation with Javier Bardem shows Foxx’s acting skills at its best. And of course, the taut gun fight in the club is why the film would seem to exist in the first place. The final act, which has Max rescuing the damsel in distress, again, is shamelessly engineered to close off Jamie Foxx’s stamped-on character. ah, the "video look." i absolutely detest it. i don't own any HD products, but i remember The Dark Knight Blu-Ray was playing on an HDTV in a store once and i couldn't believe my eyes. it was the first time i had seen the obnoxious HD video look and it was horrendous. all the romance of the feel of film was gone. it felt like i was just watching a videotape of a dress rehearsal. in other words, it was too real, and not in a good way at all. so do you get used to it? The Dark Knight shouldn't have looked like video. The 'video look' comes from the source shooting method, which in the case of 'Collateral' was (primarily) HD. Sorry to get techie here but HD is normally shot at 24 fps (same as film) and so in theory there shouldn't be a video look to HD. And for the most part there isn't. But fast motion action does seem to produce a look which separates it from film. Depending on what frequency setting you have your television set to, the video look can appear as well. So, on The Dark Knight which was shot on film, you must have been watching the Blu-Ray on an improper frequency/frame rate playback setting. I know the effect you describing, but I assure you its the television and not the movie. that's interesting. thank you for clarifying that. come to think of it, every screen in the whole electronics store was playing Dark Knight but only some HDTV's had the effect. and i did remember thinking at the time that Dark Knight was shot on film so I was definitely confused. still surprising that, even with the wrong frequency/frame rate on the TV, film could look like that. I am shocked you didn't like this movie. I wouldn't call it a classic or anything, but it is certainly compelling and a lot of fun (although I admit the ending left a sour taste in my mouth). I think Jamie Foxx is truly great in this movie. In fact, I think he deserved an Oscar far more for this role, rather than for Ray. I'm actually surprised myself how indifferent I was to the film, as I said, I was once a fan. I wanted to like it as much I did the first time 'round, but its kinda dull.